From the initial booking to the birthday party the service was fantastic. The atmosphere combines unique decor with engaging staff and fantastic food. Great service, great food and very efficient staff. A wonderful night and my guests were all impressed! I booked a table for 8 at 5pm for a meal with drinks, but we were given the waiting tables and a tiny menu of starters or burgers. My squid was literally just squid onion rings and some chips, and the pork crackling was impossible to break, never mind eat. The food was so tiny we all had food immediately after. Lovely bar, really quirky. Service was excellent and staff great. We had booked a table which was ready but we didn’t think the house music really fitted in with the vibe of the bar. We will definitely be back. Everyone had a fantastic time and commented on how lovely the food was, would like to say a big thank you to Sian for helping me sort everything and the wonderful Rachel for taking over on the day. Love this place but a bit disappointed with the fact there were no chicken wings left at our booking of 7.30 PM. Also we asked for peppers and were given a big bowl of chillis which neither of us could eat. These were taken away but still didn't get any peppers. We were then billed for the peppers we didn't get. Sunday Lunch is very good value for money - Well presented and we couldn’t fault the quality of the produce. The dessert was also welcomed - if you book online it’s included at no extra cost. Fabulous! The venue itself is impressive and perfect for any occasion if you like quirky interiors. Will definitely be back. Very disappointed with pilpil prawns. Really looking forward to them because we spend a lot of time in Spain and it’s one of our favourites. Didn’t eat the pil pil. It was prawns in garlic with none of the appropriate spices. This totally spoilt our Valentines night. Staff and manager were very polite. Eventually agreed to not charge but would have rather paid for a good pilpil. Three diners and they didn't have two of the choices,  even though menu is limited. Lovely inside and enjoyed music. Service was really good initially as in quick and friendly service but got very slow. The food was ok ish but biggest complaint..it was cold and not alot of it. Did not enjoy cheesecake. Would return for drinks but unlikely for food. Did mention re food being cold and waitress said would mention to kitchen. Great afternoon Tipsy Tea was amazing Staff very friendly.. Thank you for a lovely evening, food and service were fabulous. Reserved an area for a birthday. Helpful staff. 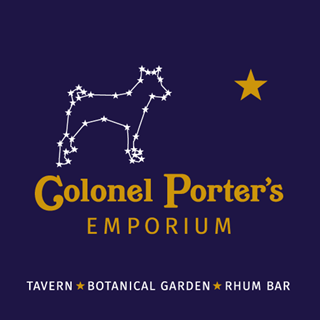 Really enjoyed our evening at Colonel Porters. Staff were lovely, efficient service, great music & atmosphere. One of my favourite bars in town.. would definitely recommend. Enjoyed a very good Sunday lunch with friendly staff and comfortable surroundings. The value was fine although the puddings seemed a little pricey for what they were. This is becoming one of our favourite places for a good Sunday lunch. Another great evening.. music and people make the venue.. roll on the next one. 壟.. cheers!! Brannon & all the bar staff were absolutely lovely and took great care of us all night. Thanks for a great Christmas party! We booked in advance and upon turning up, the friendly staff were able to help us after our booking had been removed from the system. It transpired that the venue had a booking from about 3.30pm so we can only assume that we were bumped out to suit that. Anyway, the great staff took our order and brought over our afternoon tea. Other than the sliced white bread being stale / dried out and the scones being hard as rocks, the quantity of food was great and the prosecco washed down those hard and dry bits. The place lacked atmosphere due to lack of customers, i guess that this must have been due to the notice on the door that essentially turned people away, saying last orders at 2.45pm due to the venue being booked out. I dont know if we will be back, we were looking forward to the atmosphere more than anything, but to us it seemed that the larger group booking took priority and us two who still spent almost £70 for our afternoon tea were of less importance. I hope this is accepted as an honest picture of what we experienced and dont let it spoil your decision, just be careful of those large group bookings bringing in the big money.